Our Comstock cheese-making facility and retail store are located just south of the community of Cumberland, WI. Cumberland is known as Wisconsin’s “Island City” because it’s nearly entirely surrounded by Beaver Dam Lake. 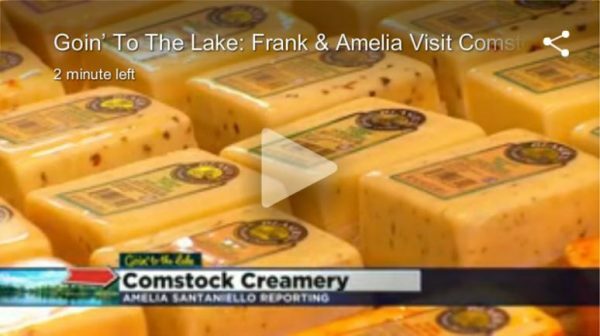 That’s why we weren’t too surprised when we heard WCCO would be visiting the heart of Wisconsin Lake County as part of their “Goin’ to the Lake” series. We were surprised, however, when we received a call from a WCCO producer saying that the crew was planning a stop at our facility on their way up to Cumberland. I guess it makes sense that Frank and Amelia would make the same stop that thousands of travelers do as they head “up north” on Highway 63 each summer. With one of the largest selections of Wisconsin made cheeses (many of them made right here at our attached cheese-making plant), plus many regionally crafted wines and beers, folks know they can find the essentials they need for a fun up-north weekend. Travelers stop to stretch their legs, browse through the shop, enjoy a cheese sample or two, and sneak a peek at the cheesemakers in action through our famed observation window. If you happen to be in our Comstock store on Wednesday, August 12, you might catch a glimpse of Frank and Amelia and the rest of the WCCO gang. They’ll be shooting some footage of their visit, which will air throughout WCCO’s evening news. Once we have the details we’ll be sure to share them on this blog post, as well as via Facebook and Twitter. Beautiful lake-country with so much for travelers to see and do… we hope you’ll take a cue from WCCO and pay a visit to our part of heaven here in western Wisconsin.